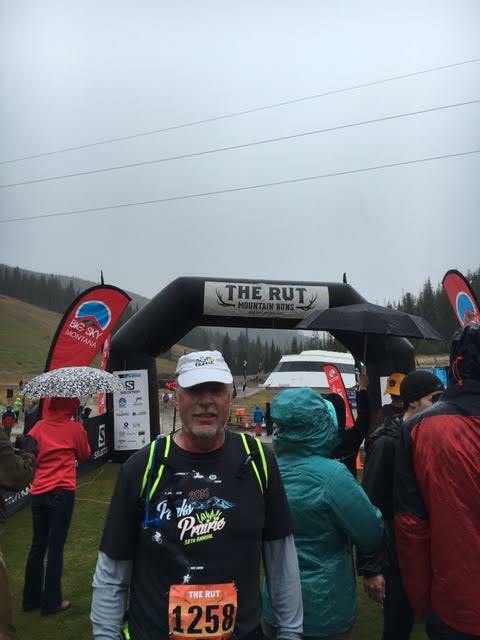 The Rut 50K - the first ultramarathon I ever signed up for. My husband and most of my friends have accused me of being insane for attempting this run. Months of preparation and this is my story. This is the view of Lone Peak when we first pulled in to Big Sky. 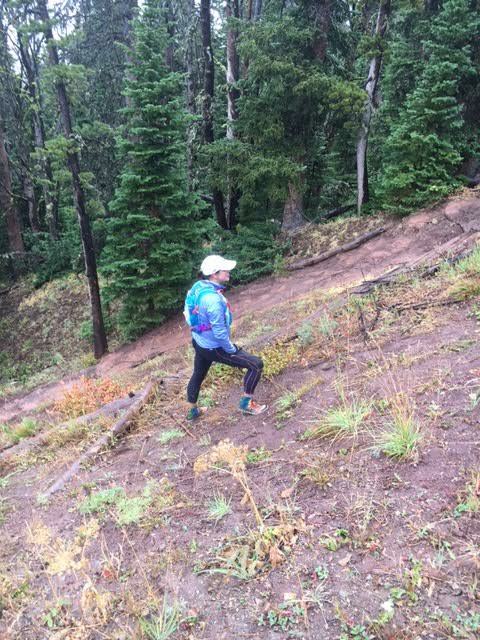 The Rut 50K includes an ascent to the peak of this mountain. I am very nervous, but anxious to tackle this challenge. 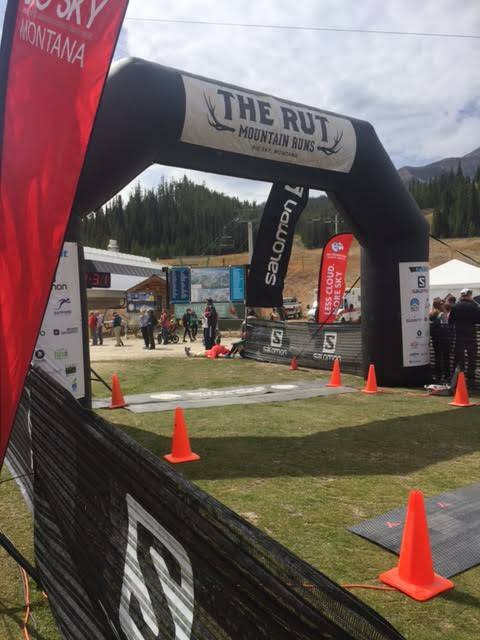 The Rut has a variety of races - A Vertical Mile (VK1), which is on Friday, 28K and a Runt Run on Saturday and the 11K and 50K on Sunday. The VK1 was altered due to weather but the 28K went off without a hitch on Saturday. It was a lovely day for the race, the "expo" and packet pickup. We cheered on a few finishers of the 28K before we headed to the hotel for check in. 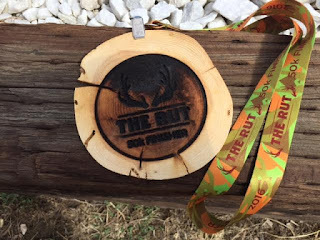 We stayed at the Huntley Lodge which offered a discounted rate to Rut runners. 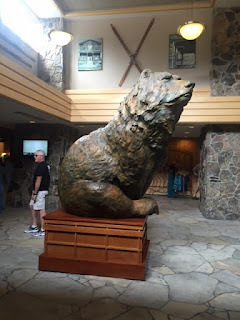 I love this beautiful bear in the lobby. Our room was nice and big. 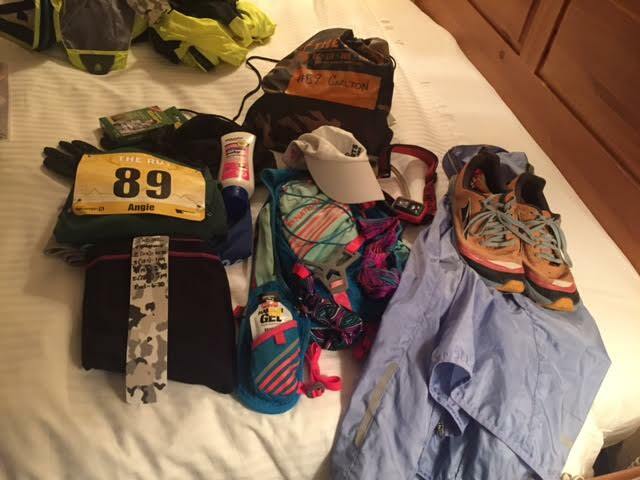 We reserved two nights so we could get up early Sunday for the race and have a place to go shower and rest when the race is done. 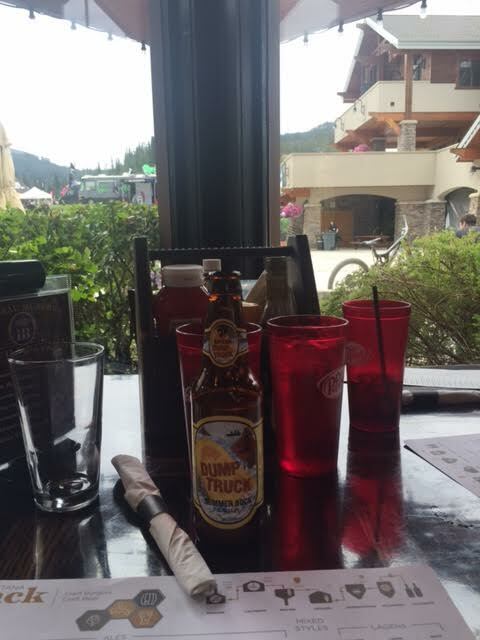 Saturday's lunch was at Montana Jack in the Mountain Village at Big Sky Resort. From our table, we could watch the hustle and bustle surrounding the 28K and could see runners coming down the hill on the final stretch. 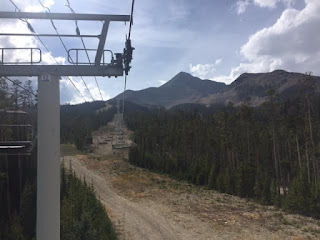 When you reserve a room at Big Sky Resort direct, you get a free pass for each person in your party for each day you are there to ride the scenic lifts. The hours are limited, so Saturday was the only day we would both be able to ride. We took the lift to Swiftcurrent and also the Ramcharger lift that went to the top of Andesite - these are both main aid stations on my race. Mitch was doing the 11K, so the Andesite was also on his course. This picture was taken when we were on the Swiftcurrent lift. It was just a tad chilly, but a beautiful day! The Swiftcurrent lift ends up in the bowl of Lone Peak. 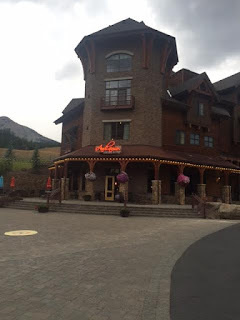 In the spirit of carb loading, we decided to have dinner at Andiamo Italian Grille which was just outside of our lodge. We both ordered the half serving of lasagna which turned out to not be very much food but was probably the most authentic Italian style lasagna I've ever eaten. I also regretted it dearly as it didn't sit well and my tummy hurt all night and half of the morning (on race day!). Delicious, but if we ever come back to run the Rut again I think I will stick with pub food. Beer is carb loading, right?? On Saturday night there was a 50K meeting. Mostly, we were all concerned about the weather and were waiting to find out if we would be doing the planned course or if it would be altered due to the expected 8 inches of snow. They announced at this meeting that they would wait until race morning at 5:00 a.m. to decide whether we would be going to plan B or not. The race starts at 6:00, so basically we would find out at the start line. Why not? I like to fly by the seat of my pants. A bonus that The Rut offered was an app. The app had all the race information you could find on the website, but also included the course maps, live tracking and updates. We would get an email with the updated course offering as well as an alert via email, app and facebook. Back at the room by 8:00 because we needed to get to bed early and still had our preparation to do. Flat Angie wasn't really an option because I had SO. MUCH. STUFF. What you don't see in the picture above is all of the fuel I brought with me. In my hydropack and my drop bag was a variety of chews, gels, waffles and Epic bars. The camo strip is a piece of KT Tape that I wrote the cut off times for each aid station. 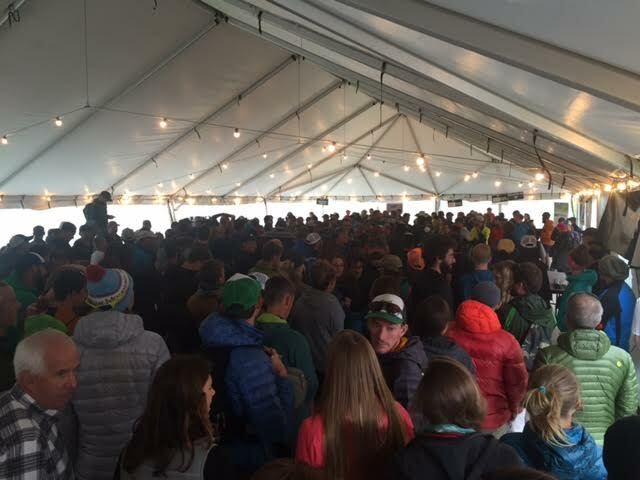 The total allowable time for the 50K was about 12 hours. Cut off times started at the 2nd aid station, but were all very generous. 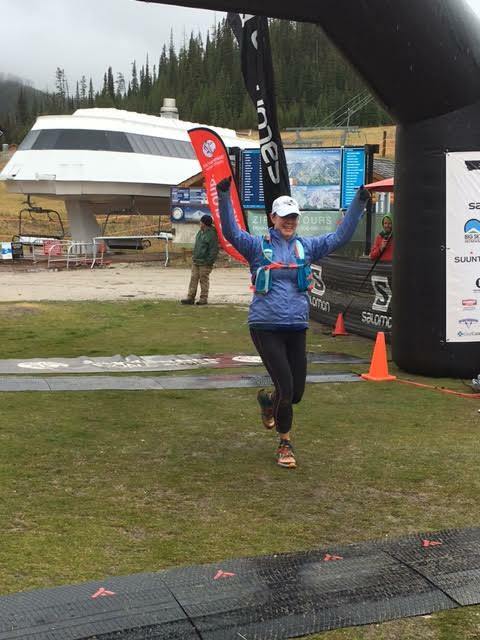 I just wanted to make sure I stayed on track, especially when I got to the tougher points of the race where I would be climbing mountains. I was tired and I figured I would sleep pretty well. Wrong! The moment my head hit the pillow, my eyes shot open. The room was noisy too. There wasn't an air conditioning unit, which meant no white noise (I'm addicted to white noise at night). 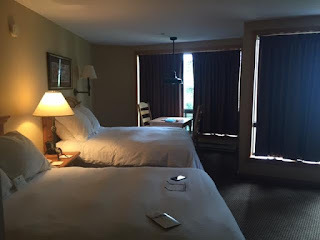 I could hear everything that went on near our room - doors, water running, coughing in the neighboring rooms... everything. Apparently, Huntley Lodge is aware of the noise in their building because they provided ear plugs. I used them and they helped a little. Unfortunately, earplugs to not drown out the sound of my own thoughts. I had no idea if I would be doing the full 50K course or if it would be altered due to weather. If it were altered, how far would it be? Would it still be an ultramarathon? If it isn't altered, did I have the courage and the physical strength to make it up Headwaters Ridge and Lone Peak? Would I make the cut off time? If the weather was poor, but they still did the planned course would it be too hard? Would it be too hard if the weather was nice? Yeah. My brain pretty much lit up all night. I didn't sleep well. Thankfully, I slept like a champ all week so I had banked enough rest to get through race day so I didn't stress about that. 4:00 a.m. my alarm went off. Two hours until gun time (actually, Elk bugle time). I got up and ate a donut. I had extra donuts and bagels and planned to eat well before I headed out. That didn't happen either because my stomach was turning. Partly it was nerves and partly it was dinner. Damn that lasagna! I drank hotel room coffee and waited. The start line was just outside the hotel, so I didn't need to leave early. It was just a waiting game now. I got Mitch up just before 5:00. His race didn't start until 8:00 but he would go down and see me off. Shortly after I woke him up, the alert came on our phones - we would be doing plan B. This meant that the course would be about 5 miles short and would not climb the alpine peaks. I was very disappointed and yet oddly relieved at the same time. When we stepped out the door of the hotel, the weather wasn't bad. It had rained, but it wasn't too cold. I had on layers and I knew that it would be too much before long. A 6:00 a.m. start meant that it would be dark. Mitch and I had been gone on a few night trail runs in preparation for this and I scored a nice headlamp just for this occasion. $40 for 30 minutes of running in the dark. No really... I'm sure I will use it again for other things. If you've ever seen the movie Hidalgo then you might have a good idea how this race began. 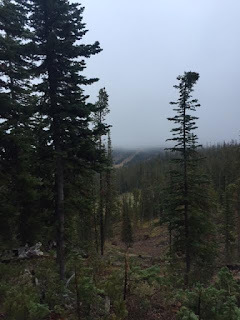 When they sounded the elk bugle, we all took off running up the gravel road in to the dark. As soon as we rounded the first corner and nobody could see us, everyone slowed from a run to a walk. We all knew that this was going to be a long day and racing up the first hill wouldn't benefit in the long run (I might have intended to use that pun). The first half mile was on this road and then turned up the hillside on to a vertical path. For a mile or so, we climbed this VERY steep trail and already I wondered why I was there. I fell quickly toward the back of the pack but I didn't care. I can't count how many times in the first few miles I thought I was last only to have someone come up behind me. By the time I reached the top of this hill, I had climbed 2,000 feet and it was daylight. The descent down the other side was steep and technical and slow but was a relief after the hard climb. The first two hours were cool and nice. The ground was a little wet but it didn't start raining until around 8:00 - Just in time for Mitch's race to start. Much of this race was on beautiful, single track trails. Some were technical and difficult while others were smooth and fast. At Moonlight Basin, there were these wooden bridges. On any nice day they would have been a lovely addition to the race but on a rainy day like it was they were treacherously slippery. You can't see it in the picture but the other side was a steep down slope. 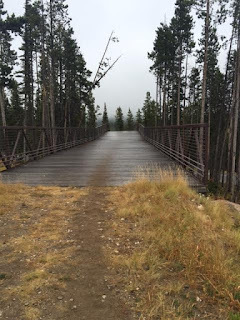 I crossed bridges like this 3 times on the course. 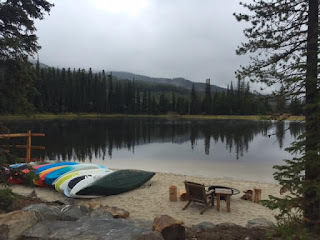 This pretty lake was also near Moonlight Basin. I was on smooth, single track and was able to really take in this moment. Since the race became more difficult after this, I didn't have many moments to stop and take in the view. The weather made a turn for the worse and it started raining. It didn't stop raining for the rest of the day and in some of the higher elevation areas it was snowing. I did not get to take any more pictures on the course at this point. With the significant amount of rain I had to keep the phone safely in a plastic bag. I tried to take it out once while I was in the bowl of Lone Peak and trekking through a scree field. My phone died the moment I tried to take the picture. The first few miles were fairly fast with the exception of the second mile when I was ascending the 2,000 foot hillside. My splits ranged between 13 and 17 minute miles depending on the terrain. I felt like I was doing awesome and was going quickly enough to make up for the miles that would take longer on the mountain later on. I know that "putting money in the bank" is a bad strategy, but in this case it would be necessary to have good splits on the miles that were flat or down hill. Around mile 13 I was completely drenched. I had put on my jacket again but by then my two layers of shirts were already soaked. I couldn't put on my gloves because my hands were too wet and they wouldn't go on. I didn't have too much trouble staying warm unless I stopped. But stopping was required to get fuel at aid stations. The "rural" aid station at mile 13 only had water. One of the guys jumped out of a van and covered me with a blanket while I filled my hydropack. He told me I had only 1.5 miles to go until the Swiftcurrent aid station and it was all on gravel roads. I had been looking forward to Swiftcurrent. I knew there would be a warm room, hot broth and restrooms. But that guy fibbed! 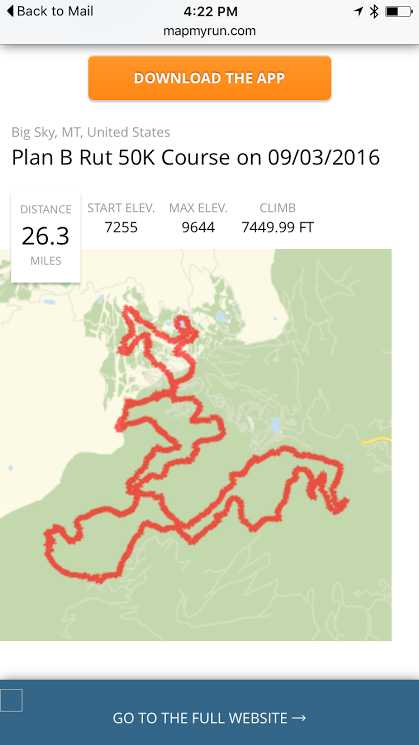 I knew I was in for more than 1.5 miles when the course markings took me off the road and back on a to a single track trail in the woods that climbed a hillside. This is the one point that I was sure I was going to quit. I stopped and cried for about a minute. I was angry at that guy for filling me with false hope and angry that I had to climb up hill again. I decided at that moment that I would be taking the lift down from Swiftcurrent when I got there. Then I got to the scree field. I had been dreading this part, but found that the rocks were mostly easy to navigate and the climb wasn't too difficult even if it was slow. 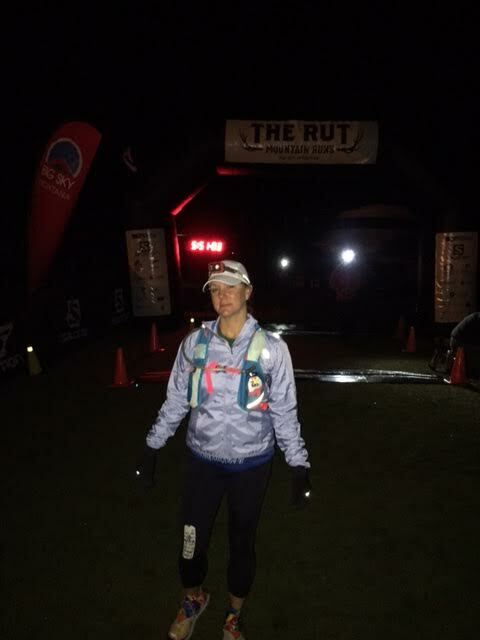 By the time I reached the aid station, my attitude had adjusted for the better. At Swiftcurrent (and most other aid stations), I drank electrolytes, water, coke and broth. The hot broth was the best thing on planet earth! The little warming room was nice, but full of people all trying to change in to dry clothes and shoes. I ate some of the food I packed and found a way to pry my gloves on to my shriveled hands even though the gloves were wet (my pack apparently isn't water proof). I brought a battery charger so charged my phone. Too bad I didn't charge my watch. I argued with myself about changing my shoes. I brought a pair of dry socks and a spare pair of road shoes in case my trail runners had a blow out. My feet were soaking wet and it might have been a good idea to change but I decided that ultimately they would be wet again in a matter of minutes and it wasn't worth the hassle. I left Swifcurrent with a group of people. Immediately out of that station we descended an extremely steep trail down a scree field that was icy and the rocks were small and loose. For a while I chastised myself for not changing my shoes. My feet were so cold. I was super slow and nervous and had to let everyone pass me. Everyone except a small group who refused to pass. Why? Because they were the sweepers and the cleaners which meant I was dead last. There was no question about it now. I could go in to great detail about all of the rest of the course, but that could take hours of writing. 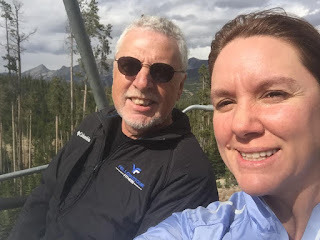 I can tell you that there were extremely steep and precarious climbs - some of which I had to stop on numerous times because the alpine air was thin and I tired quickly. Also... every bit of dirt trail had become deep, thick, slippery mud. Needless to say, I was glad I didn't change shoes after all. Having the sweeper crew was actually the best thing that could have happened to me. Listening to their conversations and having the distraction was super helpful. At one point, one of the photographers joined us and I had my own personal cheerleading team and photographer there for every step. They were amazing, encouraging me through every obstacle. I caught up with a couple of girls at one point and even passed them for a short while but they caught up and again I had the sweeper crew to keep me company. I can't tell you how lucky I am that they were there. All in all, my attitude was good. I felt good mentally and physically and even one of the ladies on the crew following me mentioned more than once that she was impressed with how positive I remained through all it. Looking back, I am amazed that I was able to do that considering how wet and cold I was most of the time. At the 2nd to last aid station (about 9 miles from the finish), I managed to reel in another runner. I had literally caught up to her just as we hit the station. 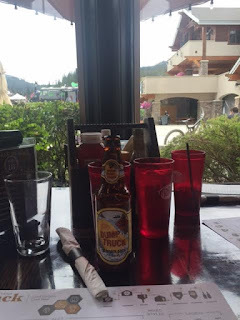 I got the skinny on what was ahead on the course and sucked down my usual routine of Heed, Coke, broth and was prepared to run off ahead of the girl I caught up to. But she was leaving in a pickup truck. She had given up. 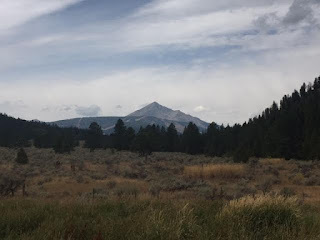 One of the volunteers had warned me that I would have a couple of little hills to climb and then I would have a doozey of a climb up Andesite Mountain. I really had no idea what REALLY was coming up. This is where I had the deepest appreciation of the team of sweepers and the photographer that were following me. 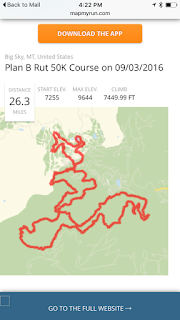 The Andesite climb was BRUTAL. It would have been rough on a nice day. In fact, it was a hard enough climb that there were ropes at two points to help get up the trail. Add to this the fact that it was completely saturated from the rain. A river of water was running down the trail. The ropes were soaked and when I pulled on the first one, my gloves immediately filled with mud and water. I only made it part was up the rope before I lost my footing. I began blazing new trails. I launched myself over to the right side of the trail, wrapped myself around a tree and found footing in bushes. I didn't realize there would be a second section with rope and when I got to it I was nearly devastated at the idea of trying it again. So, rather than trying the rope I found a way around it on the side. All this time, the crew following me was telling me how awesome I was doing and giving me hints on ways to overcome the obstacles. I've never been so happy to be last! Mitch was waiting for me at the top of Andesite. He took this picture of me working my way up the muddy hill. If you look past me, you can see the actual trail and the water running down it. Mitch has waiting here for me for about three hours because I had misinformed him of the distance I had to be from Swiftcurrent. I feel so bad that he had to wait all that time. I'm so glad he was there though! A little deviation from my own story here... Before Mitch joined me at Andesite, he ran his 11K race. He wanted to finish in under 3 hours and he did it in 1:53!!! I am so proud of him! 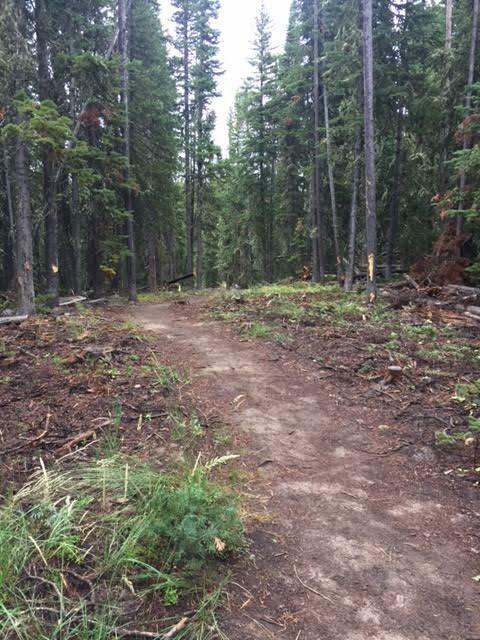 The aid station at Andesite was the last and I had five miles to go to the finish. This aid station was awesome! They cooked bacon on site!!! The last five miles felt like eternity, but most of it was downhill. I ran most of this section and somewhere on this part my Garmin died. Much of the trail was single track and parts of it were covered in thick, slippery mud. Even though I was able to run most of it, I had to stop and walk occasionally or I would slip. I've never played in so much mud in my entire life!! About 1.5 miles (give or take) from the finish, I caught up with those two girls again. This time I passed them and put some distance between us. Since I was no longer last, I also lost my crew of cheerleaders. I had one more climb to make and I hiked that bad boy like I was on my way to my last meal. I wasn't going to slow down now... so close. On the last gravel road, I caught up to a couple that were running together. They offered to let me pass but my IT Band hurt and I couldn't muster up any more speed than I was going. Mitch met me at this point also. He ran a few feet with me and encouraged me to keep going and then took a quick shortcut back to the finish line. I did it! I crossed the finish line with the clock at 10:37. My official time is 10:27 because I was in the 3rd wave at the start so ten minutes back from the gun. Tears were pretty much pouring down my face as I ran over the mats. I was greeted by Mitch and a small crowd of volunteers and a finisher's medal. Can you see the pure joy on my face in this picture??? It is unfortunate, but because they changed the course the route was the distance of a marathon and I cannot claim this as my first Ultramarathon. It counts as my first trail marathon and is by far one of the most challenging things I have ever done. I find comfort knowing that I finished a short course in extremely difficult conditions with an hour and a half remaining on the course cut off time. Based on this, I believe I could have finished the full 50K (including the climb to Lone Peak) in ideal weather within the allowed time. I don't know that I will ever give this particular race another go, so I might never know for sure. My reward for making it to the finish line. It is very unique and it smells like a campfire! Fun fact: About 25 people dropped out of the race. That's a 10th of the field. Finishing was a huge accomplishment. Race Schwag: The shirts ran exceedingly small and they didn't allow us to exchange. As a result, I have a shirt I may never get to wear and Mitch had to give me his. There were no other items in the race bag, but the bag itself is pretty cool. It is camo with an elk silhouette on it (you can kind of see it in the picture of my gear above). Race course: Beautiful. By far this was the best marked course I have ever been on. There were flags just about every meter. You could not get lost running this race. Aid Stations: I was pleased with the aid stations. I do not have any other ultramarathons to compare to, but The Rut provided candy, chips, pretzels, gu, coke, Heed, water and hot broth at most of the stations. The volunteers were always super helpful and willing to do anything you needed. My only complaint was the guy that gave me incorrect information. Other perks: There was a tent full of Rut gear and other items for purchase at the start/finish line. They didn't have stickers, which I was sad about. There was massage, beer, food (Mitch said the food was unique and very good. I didn't go to the post race meal because I just wanted to get to my room for a shower and dry clothes). There was also a guy giving free Rut tattoos, but he was gone by the time I finished. There was a big after party on Sunday night. I was coughing a deep, wet cough after I was done running and I was afraid I was coming down sick so I didn't go. I'm a little sorry that I didn't, but ultimately I just needed a good night sleep anyway. Communication: The Rut had stellar communication. A few weeks prior to the race, they had a Q&A session at a running store in Missoula that they also live broadcasted on Facebook. The app had any information you could want, but there were plenty of emails and facebook posts leading up to the big day as well. The race director was as good as his word about when we could expect notifications of race course changes and provided up to the minute updates of the GPS course maps. Overall: This was an awesome event that was very well supported and the volunteers were amazing. I would recommend this race to anyone that has a strong sense of adventure and is willing to put in the time to train for such an event. 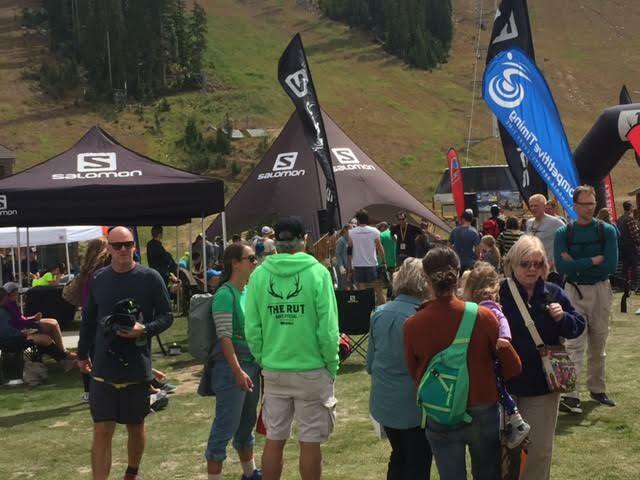 But you should know that this race sold out in less than two days from the day registration opened so if you are interested you need to be prepared to sign up as soon as it goes live. I feel like my fingers just ran that race all over again! If you made it this far, thank you for reading all the way through this long post. Happy Trails!